Rightio, what else can I do tomorrow? I have a list of items to choose from … the question is, which one will win out? Anne S • This entry was posted in Finishes. Bookmark the permalink. Hi Anne 🙂 They look gorgeous!! Hi Anne, well done on your finishes. Would you like me to send some kiwi sunshine your way, lol. We’ve had some very muggy days this week, a few downpours too, but thats good as its getting very dry around Hawkes Bay. Yes,I can’t wait to go to Palmy, I LOVE the shops there, went to Massey Uni myself so its like my 2nd home, lol. Wow Anne! Both are stunning! Wow! 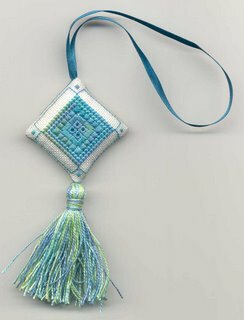 Exquisite! Outstanding! They are both so delicate and elegant! My Egypt Garden kit arrived today… when do you like to work on yours? Maybe I will SAL a little with you?? Your finishing skills are SUPER! 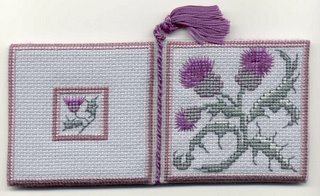 I especially find that thistle needlebook beautiful. Great job!! These look great, Anne! You should be proud of yourself for finishing some things that have been languishing for a while.